Operations Challenge is the "Wastewater Olympics" for professionals in the wastewater treatment industry. Teams of 4 members compete in 5 separate events: operations, maintenance, laboratory, safety and collection systems, at a regional level to earn the right to represent Florida at the national competition at WEFTEC. During this event you will receive valuable training on the new equipment and tools used on the wastewater field being showcased on the Operations Challenge competition 2018. You will get a hands on experience on the tools and equipment to increase the level of confidence and accuracy to safely complete a task. Meeting/Instructional starts at 9am followed by process control training. There is no cost to attend, but please register. Join us for this incredibly informative one day seminar. We have assembled a group of nationally recognized engineering experts in the field of odor control. Come join FSAWWA Region II and FWEA First Coast Chapter for their 5th Annual Sporting Clay Shoot. Description: Pasco County Utilities is an industry leader in non-potable reuse. The Pasco County Master Reuse System is the sole method of wastewater effluent management for Pasco County. Over 23 million gallons per day is reused through irrigation, groundwater recharge, and industrial reuse. As the County has grown without proportionally increasing the irrigation customer base, additional reuse strategies were needed to manage wet weather supplies with dry weather demands while providing the maximum benefit to the water resources of the region. 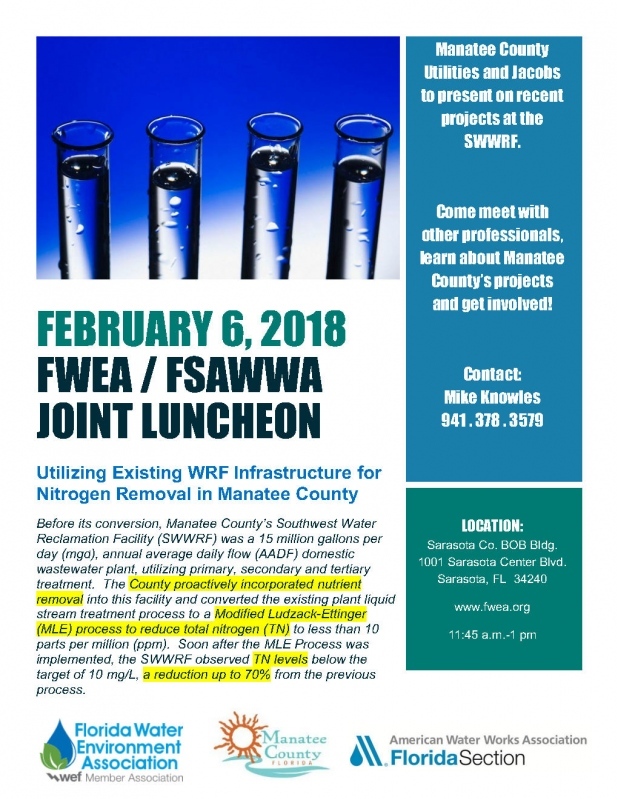 This presentation will focus on the County’s approach to complete reuse, recently implemented projects that support better management of seasonal reclaimed water flows, and the project benefits that have led to unique design and construction strategies to achieve funding support to accomplish the County’s goals. Mike is a Professional Engineer with twenty years of environmental engineering experience in both the government and private sectors. He holds a Bachelor of Science in Civil Engineering from the University of South Florida and a Master of Business Administration from the University of Florida. He is currently the Director of Engineering for Pasco County Utilities where he is responsible for all utility planning, service commitment, capital delivery and operational support. Jeff is a Senior Environmental Scientist for Pasco County. He’s been working in the ecological sciences industry for more than 15 years. Prior to, he served in the United States Navy aboard the aircraft carriers, USS John F Kennedy and USS Dwight D Eisenhower. After nearly a decade in the Navy, Jeff earned an Environmental Science degree from Florida International University. Since then he’s been dedicated to the protection and sustainability of natural resources in Pasco County, as part of Broward County’s Environmental Protection Department, and Palm Beach County’s Environmental Health Division of the State Health Department. Most recently, Jeff served as the Project Manager for Pasco County’s 4G Wetlands Project; winner of regional, state, national, and international environmental excellence awards. Please join us for our 2nd Annual Sporting Clays Tournament.